SWANK | What Does SWANK Mean? SWANK means "Single Woman And No Kids and "Second Wife And No Kids". "Single Woman And No Kids". 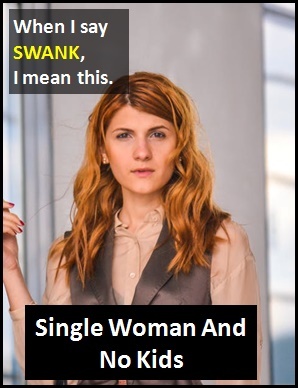 The acronym SWANK is typically used on adult dating sites and in personal advertisements with the meaning "Single Woman And No Kids" as an indication of the status of a woman seeking a partner. SWANK may also be used by someone seeking a female partner who is single and has no children. "Second Wife And No Kids". Less commonly, SWANK has also been noted with the meaning "Second Wife And No Kids". In this context, SWANK can refer to the status of a woman who is a SWANK or a man who is married for the second time and has no children. Mugger: That's a pretty SWANKy watch you've got there. Give it to me. Victim: I also have some pretty SWANKy Krav Maga moves too. Would you like to see them? SWANK also means "Second Wife And No Kids". Ed: Yes. She is definitely SWANK. (Here, SWANK means "Single Woman And No Kids ". Shannon: Don't tell me he's married! Caz: I'm afraid so. In fact, he's SWANK. (Here, SWANK means "Second Wife And No Kids". Whether used with the meaning "Single Woman And No Kids" or "Second Wife And No Kids", SWANK is an acronym (i.e. an abbreviation spoken as a word). Acronyms differ from initialism abbreviations, which are pronounced using their individual letters. The use of SWANK in personal advertisements to mean "Single Woman And No Kids" pre-dates the digital era.